This articulated motorhome from Germany lays claim to being one of the world's largest. In fact it was in the 1997 edition of the Guinness Book of World Records as just that -- the largest motorhome in the world. Plug time -- if you're looking for great deals on motorhome rental in Germany -- and let's face it, most of us don't need a motorhome this big! 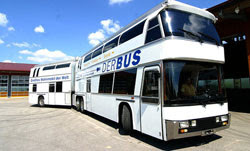 -- go to www.cheapmotorhomerental.de. Deals include two, three and four berth motorhomes from €67.52, five berth motorhomes from €77.29 and six berth motorhomes from €92.73. Click here to book online and take advantage of these great deals. Camper Australien und Camper Neuseeland? Jawohl!